Gold is up, even getting a positive mention in Barron's. Is it Japan's election or the tapering of the taper talk that's driving gold higher of late? Is this a bounce or the beginning of a new major uptrend in gold? Until just a few weeks ago, pundits fell all over themselves to call an end of the gold bull market. Those that bought gold 10 years ago called the "correction" a blip; those that had bought in recent years required therapy; and those that never bought gold in the first place proudly proclaimed "I told you so." Most would agree that the selloff in gold was rather vicious. And that may well be where the explanation of the most recent move lies. We have often argued that we like gold because of its "monetary sensitivity," that is, the sensitivity to the mania of printing presses around the world. We like gold because of its comparatively simple dynamics. However, when gold moves higher twelve years in a row, no matter what our central bankers may be up to, the shiny metal can take on a life on its own. Relevant to the discussion is that with speculators washed out for now, gold is able to play its more traditional role. And policy makers around the world try their best to instill life yet again to the metal. Most notably, with Federal Reserve Chair Bernanke tapering his taper talk; and, most recently, the party of Japan's Prime Minister Abe winning the Upper House, paving the way for more expansionary fiscal and monetary policies. While many in the gold community are glued to every move in the price of gold, we are just as passionate in studying other asset prices; we may be best known for our analysis of the U.S. dollar in the context of other currencies. We closely study morphing correlations: for example, a year ago, after European Central Bank President Draghi gave his "I'll do whatever it takes" speech, money didn't flow towards gold and commodity currencies (the Australian and Canadian dollar, to name but two); instead, the euro was the prime beneficiary (for more background predicting this dynamic, please see our August 2012 analysis: Draghi's genius). What happened was that gold wasn't cheap; commodity currencies were pricey, but the euro had been held back, possibly for all the right reasons. Even if some didn't think the euro was cheap, most would agree that the euro became less uncertain after Draghi took away some tail risks. As such, money flowed to the euro more so than elsewhere when investors had expressed an appetite for risky assets. Fast-forward to today, and gold is currently the ugly duckling. And as monetary policy appears on a more accommodative path than a couple of weeks ago when "exit" and "taper" talk was all the rage, it's the ugly duckling that gets to shine. What about the longer term prospect for gold? Let's zoom in on the tapering of the taper talk, most notably two key areas: unemployment and housing. Bernanke is now quite vocal that unemployment numbers are masking underlying weakness. I'm not sure whether he has been reading Merk Insights, but he points out, amongst others, that we create many part-time jobs, while reducing full-time jobs. Employers won't need to offer healthcare for part-time employees when Obamacare is fully implemented, thus providing an incentive to move full-time jobs to part-time jobs. The labor participation rate, historically shrugged off by Bernanke as merely being a sign of an aging population, is also getting more attention. Someone must have pointed out to him that the elderly are actually working more; it's the up to 55 year olds that are not participating in the labor force as much as they should. Simply said, Bernanke is putting more emphasis on the glass being half empty with regard to the employment picture. We agree that unemployment is a bigger problem than the statistics make them appear to be at first sight. With regard to housing, after first panicking when faced with substantially lower bond prices (higher yields, higher cost of borrowing), Bernanke has toned down his rhetoric that yields must come down. His view now, as expressed in his testimony last week: as long as housing doesn't suffer, higher mortgage rates are okay. A key reason why gold may be moving higher may well be that the market doesn't believe in the sustainability of the housing recovery. Sure, home prices are up. Sure, in the Bay Area, where I live, there's yet again a buying frenzy. But note that there's no construction boom, suggesting the recovery is all financial. Mortgage rates have jumped a full percentage point, catching many buyers off-guard. In the short-run, some purchases might fall through; in the medium term, we would not be surprised to see some housing data shock Bernanke. The canary in the coal mine may be that Blackstone, the private equity firm, has amassed a lot of commercial and residential real estate in recent years; now the firm is preparing IPOs to allow an exit strategy for its investors in commercial real estate. Commercial real estate tends to be even more interest rate sensitive than residential real estate, but it may well be an omen that the "smart money" that helped push up prices is heading for the exit. In summary, with regard to housing, we think Bernanke may soon find the glass to be half empty, encouraging him to err on the dovish side, a likely positive for the price of gold. Bernanke also said that a key reason he started the taper talk was speculation he and his colleagues had seen in the markets. Greenspan called it "irrational exuberance" in the 1990s and got a lot of heat for trying to control asset prices. But make no mistake about it, Bernanke's taper talk was his irrational exuberance talk. Our take is that Bernanke is less interested in tapering, but concerned about some of the side effects of his policies that cannot be ignored any longer. 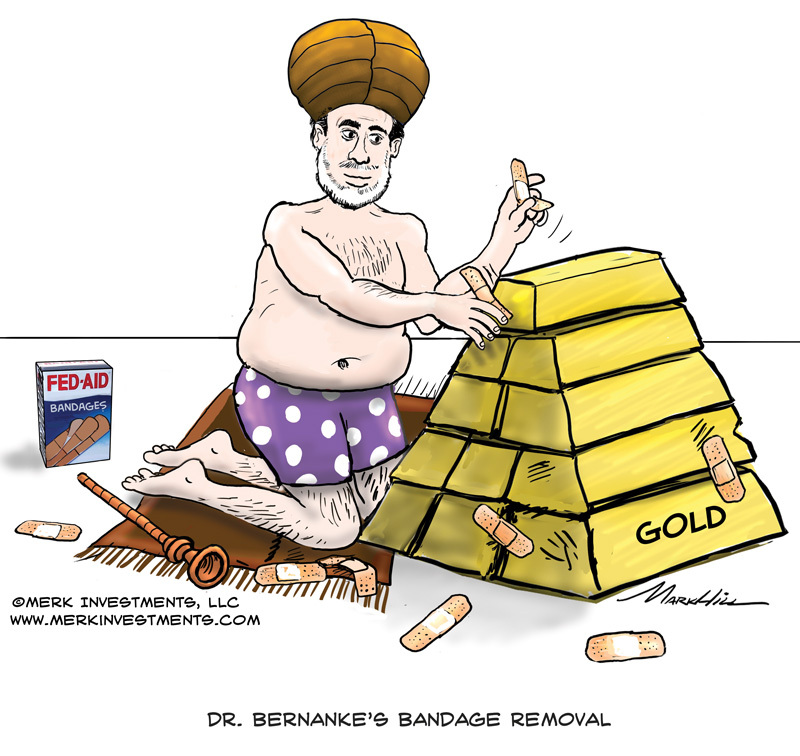 To understand Bernanke, also keep in mind that his term is coming to an end. Like anyone, we believe he may be concerned about his legacy. He wants his resume to state that he not only presided over the financial crisis, but he also started to wind down the response policies as he headed for retirement. As such, his talk may be more driven by wishful thinking than the "old" Bernanke we are used to. In the same context, during his testimony, more than one Congressman referred to a "eulogy" in thanking the Fed Chair for his services. Relevant to the markets is the question of who will succeed Bernanke. The most likely candidate in our view is Janet Yellen, the current Vice Chair at the Fed. When the transcripts of 2007 Federal Reserve Open Market Committee (FOMC) meetings were published, she was praised for astute understanding of the dangers the U.S. economy faced; in our assessment, she is also substantially more dovish than Bernanke. Tim Geithner has come up as another choice; Mr Geithner thinks he saved the world and is proud of it. You may agree or disagree; relevant is that he is emboldened to be interventionist; while we would have thought he might be more of a technocrat, his recent speeches appear to suggest that he, too, thinks, a Fed exit is many years away. Confirmation hearings for Geithner might be dicey, in part because it would provide a stage to quiz Geithner about his role as Treasury Secretary in overseeing the IRS and the political influence he might have exerted. And then there is Larry Summers, these days maybe best known for his condescending views of women. Clearly Mr. Summers has other qualifications, but in my assessment, President Obama may have a lot of explaining to do regarding why he passed over the first woman to be Fed Chair should he appoint Summers. Summers is a fantastic debater, as well as a most polarizing person. Indeed, he might be able to provide "strong leadership." In our assessment, at the core, Summers is ideologically to the left of just about anyone in Congress, firmly in support of "when in doubt, spend." Finally, while the earnings season hasn't come to a close, note that revenues at many companies are on the light side. Again, even if firms can manage their expenses well, lackluster revenues aren't exactly compatible with a strong economic recovery. Please make sure you are subscribed to our newsletter so you know when the next Merk Insight becomes available. Also, please join us for our upcoming webinars that discuss gold or the currency asset class in more detail: click to join our webinar list ; our next Webinar is Thursday, August 22nd.